About a week or so back we finished reading Ramona the Brave . 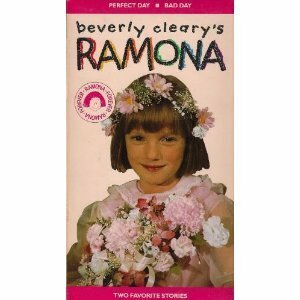 I remember reading and loving Ramona growing up. I also loved the television series on PBS starring Sarah Polley (Road to Avonlea). I remember the exact moment when I saw the advertisement for the Ramona show. I was at a friends house and was just ecstatic. They didn't care nearly as much as I did, as I recall. Did anyone else ever watch this series growing up? Please tell me I'm not alone! Since I have fond memories of Ramona from my childhood years, I have been eager to introduce my children to her. 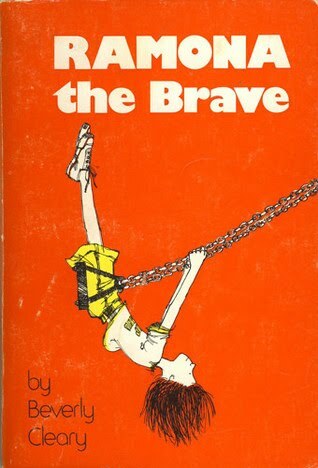 I also feel it an obligation, of sorts, to do so being that Beverly Cleary was born and raised in Oregon. At some point, we're going to have to go visit the Beverely Cleary Sculpture Garden up in Portland. But probably not until we've read Henry and Ribsy as well. I mention all of the above to introduce the fact that I finally decided that my oldest, Bookworm1 (age 5 3/4) was probably ready to read Ramona. We began with Ramona the Brave . I have to say that all my happy nostalgic feelings sort of fizzled away with this reading. I never realized how much of a brat Ramona can be! She is big on hissy fits and boy do she and Beezus ever not get along! It's almost painful for me to read. Ramona says and does such funny things. Reading about six year old Ramona to an almost-six-year-old informs me that Cleary clearly understood children. She gets them. Ramona was an easy character for Bookworm1 to identify with - and laugh at. His favorite part was by far and away was when Howie comes over to play Brick Factory. We were reading the book downstairs in our basement and I was trying to make the scene sound as ridiculously funny as possible. Bookworm1 laughed so hard and so loudly that Daddy heard us upstairs. His second favorite part was when Ramona gets scared of having the book in her room which includes a scary picture of a gorilla. She finally gets the idea to offer the book to her dad, so that he'll take it out of her room. She doesn't want to admit that she's scared so she just tells him of the book, "I think you'll like it." Bookworm1 got some giggles out of that one also. As Bookworm1 grows, I know we'll have more of these issues with book characters but I think that's ok. (I'm telling myself that's ok.) If we learn to be discerning and grapple with issues in the stories we read, and learn how to correctly apply truth to our lives, then we're good. And we're having fun, spending time with one another and laughing. So far so good. I still have more to learn! You know what? I think it's perfectly okay to read stories about less-than-model behavior. Paragons of virtue don't make very interesting heros or heroines. ;-). Besides, how realistic would it be if their only interaction with each other was all sweetness and light? The truth is we are all sinful humans, and while we shouldn't glorify sin, to make every story perfect would also make them untrue. I love the Ramona stories. The Harper (?) audiobooks are excellent. My favorite scene (not sure which book it's in) us the "I want some PTA!!!!!!" scene. I'm definitely with Amy on this issue. I think kids need to feel that there are others in this world that struggle with the same things they do. Plus, a little fantasy safety valve can be good. Us boys may not dream of being princesses, but we sure would love to make a mess and horrify our mothers. I had no idea that there was a TV show, but we didn't watch much when I was that age. And yes, I spent a portion of my childhood playing "brick factory." So I was very curious as to what you would think of these bc I think when I read them aloud to my students I realized what a brat she was, at times. That said, I like your discussion of the attitudes and consequences. I agree...would rather read together than independently. Recently I took Ivy and Bean from the library to see if I wanted M to read it on her own. No. Next up, Nate the Great. We'll see. Just trying to find shorter books. If bookworm1 likes these books, you have to add Cleary's book Otis Spofford to your list. I remember all of us laughing so hard when my mom read them to us. Plus it is geared more toward boys. I watched those Ramona movies with my older children, and I thought they were wonderful. I'm not sure that children copy what they read about in books as much as they identify with characters who are struggling with the same issues they struggle with. They're able to see that Ramona usually gets herself into trouble and misses out on good stuff when she misbehaves. I *LOVED* Ramona when I was a kid, I can still see the orange hardback copy of my favorite in the series. The line I DO NOT cross is the mamby-pamby father figure who is portrayed as an idiot and is considered to be the walnut brained court jester. I remember feeling assured that Ramona wasn't a perfect child, that everyone makes mistakes. The only movie I've seen is the newest Disney edition with Selena Gomez, which I loved and my boys were a little, well ok, totally bored with! Now, Carrie, she was Ramona the PEST after all. :) Just kidding--I completely understand what you are saying, and I think it's great that you are discussing the behavior, but I will always love Ramona. As you said, Clearly portrayed the mind of a child masterfully. I LOVED Ramona as a child, and I vividly remember connecting with her in Ramona the Pest. Her actions were so often sincere, but misunderstood by the grown-ups, and that is so frustrating to children. This series is a beloved favorite of mine! Another fun series with the cute, ornery younger sibling are the Sam books (Attaboy, Sam, for example by Lois Lenski--and we didn't read the Anastasia books of the same series about the older sister). I'm remembering three of them and he's more ornery/innocent and less naughty than Ramona. You might enjoy them with your boys as well. I loved Ramona books when I was a kid. By the way, I finally made the taco pizza last night. Very tasty! I'm not a huge fan of her bratishness but I've allowed my kids to read the Ramona books. I much prefer the Henry and Ribsy series because of the lack of bratish behavior. Just highly imaginative kids getting into scrapes.